When you have a parenting question who do you ask? I usually try my family and friends, but often times they have no idea if it’s something they’ve never dealt with before. I’ve tried Googling but it takes forever to wade through irrelevant information to find the answers I’m looking for. Sometimes I have a very specific question and it’s difficult to search out the answers. 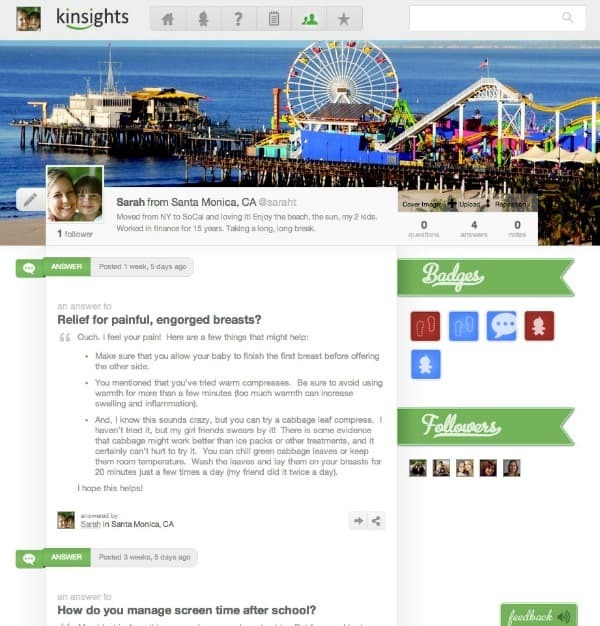 Today I wanted to share with you a community site called Kinsights that is a smarter and easier way for parents to get and share advice. At Kinsights you can ask all your parenting questions no matter how trivial you think it may be. 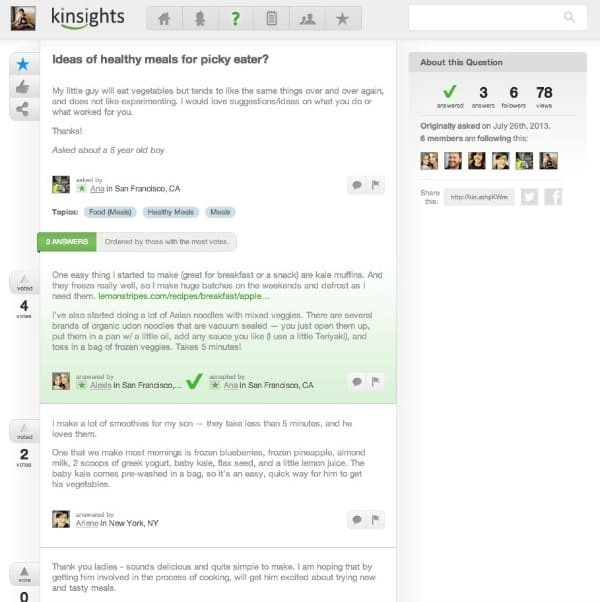 Kinsights will find community members who can help and provide you with advice. For example, if you’re child has a food allergy and you have a related question, you’ll be connected with other parents who have dealt with the same issues as you. For each question, members can vote up the answers so the best ones will rise to the top of the list. Any tips for breaking a 13-month-old baby’s sleep association? Will speaking to a toddler in a second language stunt their development in the primary language? At what age should you start letting your daughter shave her legs? How much online privacy do teenagers need? How do you keep packed lunches interesting? What I love about Kinsights is its for parents with kids of all ages and not just for moms of babies and toddlers. I know that I often need advice even though my kids are older. I’m actually dealing with my youngest daughter wanting to shave her legs. She feels really self-conscious about how much hair she has on them. I was very interested in reading the answers to that particular question to get other parents’ insights. In addition to browsing through all the questions, you can also post your own. Whatever parenting issue you are struggling with or needing advice on, ask and see what others say. There’s also a Notes section where you can share your thoughts and experiences on a subject. I found a note on Safety Tips for the Holidays shared by pediatrician, Dr. JJ, that had loads of tips on how to keep your little ones safe this time of year. 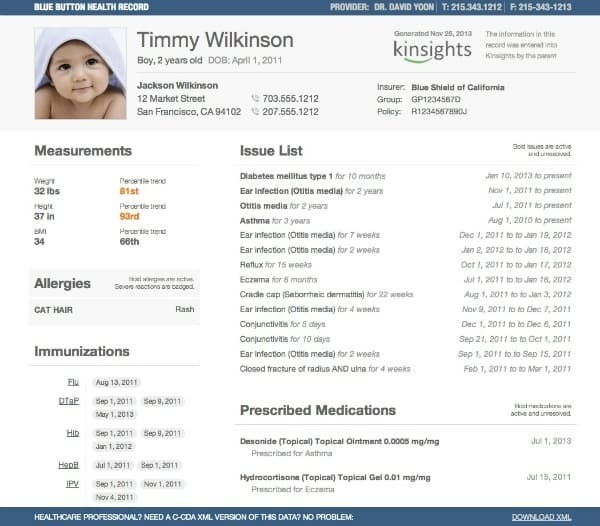 Another neat feature of Kinsights is the interface to create health records for each of your children. Here you can keep track of medications, allergies, immunizations, milestones and more. Keep track of it here rather than carrying around a bunch of loose papers in your purse! It’s easy to edit and view. I would have loved to use this to record my girl’s height and weight when they were babies. I always wrote down their milestones on slips of paper, but I have no idea where those are now. You can also print a copy of your child’s health records and keep it on your fridge for easy access for sitters. It helps to have everything you need in one place in case of an emergency. If your child has a health condition (ie. eczema, asthma, etc), you can join and/or create a private group for parents who also have children with the same condition. One more awesome thing about Kinsights….it’s FREE! There’s no charge to join or hidden costs. Ask questions, peruse answers, be active or lurk, it’s up to you. Join Kinsights today!